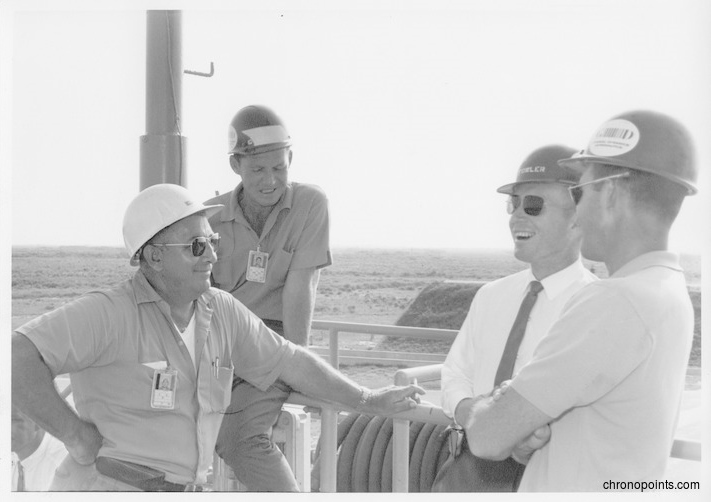 Dr. Calvin D. Fowler with others at Cape Canaveral Air Force Station Launch Complex 14 (LC-14). Dr. Fowler is photographed second from the right. Dr. Fowler was the manager of Cape Canaveral Air Force Station Launch Complex 14 during the final three launches of Project Mercury. From the blockhouse at Complex 14, after confirming the mission was a go, Dr. Fowler pressed the button to launch Wally Schirra (1923-2007), Scott Carpenter (1925-2013) and Gordon Cooper (1927-2004) into space aboard their respective rockets. 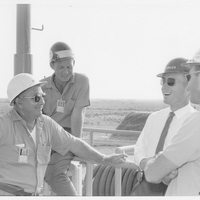 He is pictured chatting with workers at the launch site. “Cal Fowler and Others at the Cape Canaveral Air Force Station Launch Complex 14.” RICHES of Central Florida accessed April 22, 2019, https://richesmi.cah.ucf.edu/omeka/items/show/4967.